Tinuy-an Falls was the main reason for our Bislig visit. It has been hailed as the widest waterfalls of the Philippines and among the shortlist of my must-visit place in our dear country. Along the way, Kuya Peter graciously answered any inquiries we tossed, even about the trees that we passed by. According to him, falcata tree is generally a paper tree and the common crop of the locals but some raised the higher class manguim trees which are used best as money paper. We also saw from afar tall towering trees that the locals dubbed as an “umbrella tree”. This early wisdom was my companion during the trip that compensated my shivering and awkward seat. Since we were among the early visitors at 7:30am, the place was all ours and we had clean angles for different shots. I was so enthralled of Bislig's hidden wonder and even if I’ve been to several waterfalls already, Tinuy-an stood out exceptionally. It truly deserves to be called majestic Tinuy-an Falls. From DENR website: The falls is approximately 95 meters wide and 55 metres (180 ft) high, touted as the Niagara Falls of the Philippines. Tinuy-an is a white water curtain that flows in three levels and is said to be one of the widest waterfalls in the Philippines. 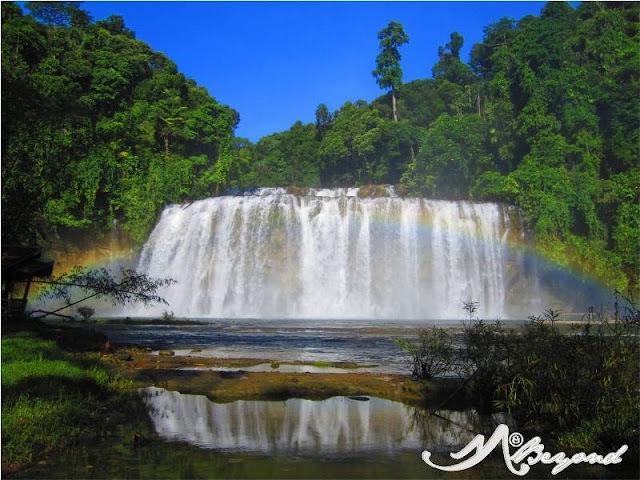 Every morning, the area is blessed with a sprinkle of a rainbow that appears between 9 a.m. to 11 a.m. Its majestic and unique natural formation makes it one of the best waterfalls in the entire Philippines. After several shots by the main falls, we were offered to climb the upper tiers. An established steel stepladder was mounted on the rocks for an easier ascend. According to some, Tinuy-an was just a three-tiered but for me, it sort has a mezzanine-layer that made it looked like a four-tiered waterfalls. We also crossed the wooden bridge for a different angle of the falls. It was here that the rainbow formed to its fullest. Nipa huts and cottages with bigger rooms are also available at this side of the river.